In Elgin, First Church and Community:Elgin worship concurrently but in separate buildings on the same property. United Methodist disciples are transforming lives in a most unusual way at Elgin, Oklahoma. They’ve embraced a vision cast by a modern-day Paul and Barnabas. Two churches started simultaneous worship services at one location on March 12 in the town north of Lawton. The distinctive partnership is between Elgin-First UMC and Elgin:Community UMC (previously Community UMC in Lawton). It connects a traditional rural congregation and a new-church plant of the Oklahoma Conference. It’s a strategy endorsed by a 2017 grant of $40,000 approved by the Conference’s New People New Places awards panel and made possible by Apportionment giving. Young pastors Phil Hodson and Nathan Mills describe themselves as leading like Paul and Barnabas in the earliest days of Christianity. Their abilities complement one another, and they relish the collaborative work in the mission field. "Nathan and I are just leaning into what God is doing," said Rev. Hodson of Community. "The folks at Elgin can educate and mentor new Christians through every opportunity. We are transferring DNA. We are carrying a culture forward into a new generation." Perhaps this venture was birthed when Rev. Mills learned from a longtime First member about her neighbor who regularly passed the hometown church on the way to Community’s undoubtedly contemporary service in Lawton. "Elgin is a community that’s changed," Mills said. A rural demographic has been supplanted by a suburban identity, according to the Mission Insite research tool available through the Oklahoma Conference. It’s a short drive south to a U.S. military base and Lawton’s urban opportunities. The U.S. Census reported that Elgin’s population jumped from 1,200 in the year 2000, to more than 2,000 people in 2010, to a current estimate of 3,000-plus residents. Meanwhile, in a rented Lawton warehouse, Community had run out of space, Hodson said. Worship attendance topped 90 several times, and the MOPS (Mothers of Preschoolers) program was "busting its seams." People who feel too crowded won’t come back, he said. His heart especially was torn for the 90 percent of Community’s people who hadn’t previously engaged in a church. "They’re just learning the faith. They don’t know how to build a church." The Hodson and Mills clergy families already had built a friendship. The pastors began dreaming. Oklahoma Conference leaders helped them dream big. The New Faith Communities Ministry Team urged Hodson "just move" because of the lack of space. Mills recalled Chairman Mark Foster told them to think about what they could do if they shared resources. "It really hadn’t occurred to us." So at First Church in Elgin, the pastors and interested people met together and talked strategy. They read the books "Better Together" and "Renovate or Die." They wrote a partnership agreement and formed a joint council to administer it. Beginning in December, renovation work began on First’s property. Now the congregations worship in separate buildings but share childcare space and staffing. First’s traditional service began benefiting from the transition before the simultaneous launch date, Mills said. "We had 75 people last week (March 5)." Family Night programming on Wednesdays at First drew about 12 people last year, according to him. In joint programming during the first months of 2017, attendance averaged 53. Wichitas District Superintendent Connie Gibson expressed her excitement. The partnership "was begun and has grown from the heart for ministry and making disciples in two different congregations." She said it "truly represents our connectedness as United Methodists, since it pulls together gifts, graces, and resources from two Families of Faith with a common vision and focus … in the great mission field in which God placed them." She celebrated "the willingness of the people of Elgin-First UMC to genuinely welcome other United Methodists to come share the facility resources they already have in an area that is growing." She applauded Mills’ leadership and vision to partner with another United Methodist church that is sharing God’s love in different ways. Hodson’s "passion for making disciples and doing so in ways that will reach more and more new people and Lawton-Community’s willingness to relocate in order to make more disciples also exemplifies that true focus on our mission," Rev. Gibson concluded. 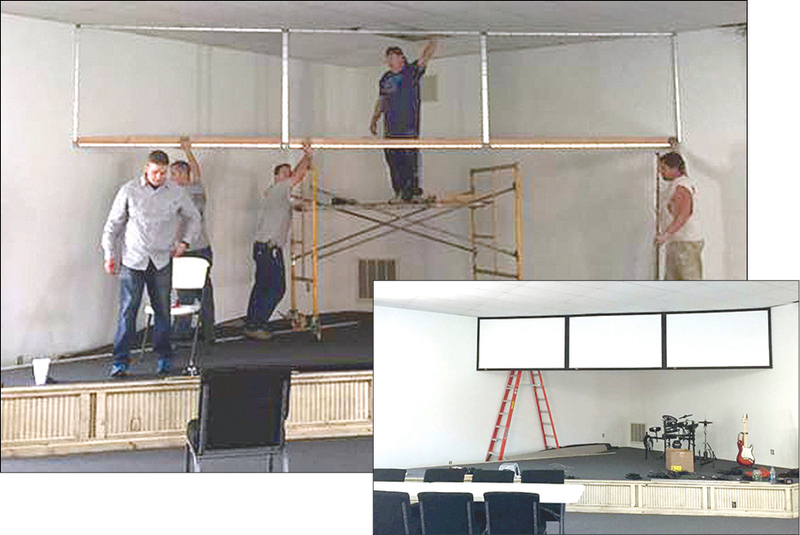 Screens go up inside Elgin-First’s fellowship hall to create worship space for Community: Elgin’s contemporary services.